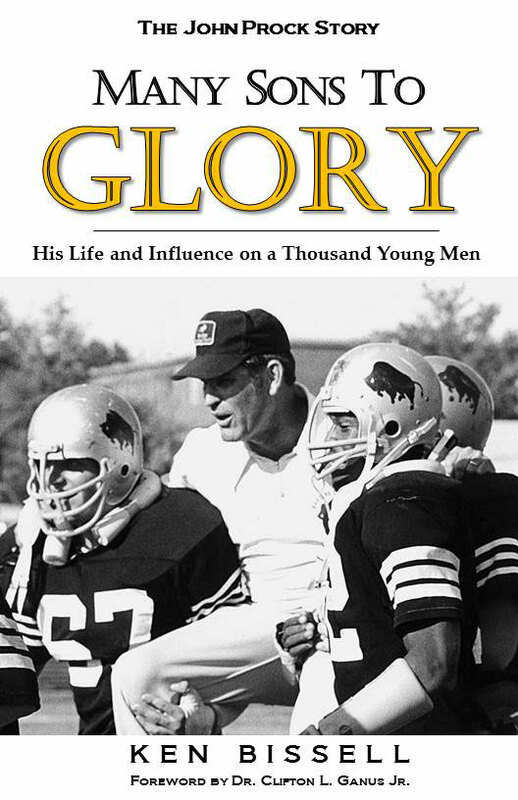 My friend Ken Bissell published a book called, Many Sons to Glory. The book is the story of John Prock, "his life and influence on a thousand young men." I started Harding about Prock ending his coaching career. My cousin, Brooks Davis, played football, and I lived on the "football wing" of the freshman dorm. So I knew many of those named in the book in this era, making it a fun and personal read for me. In addition, I worked for Ken Bissell in the Public Relation-Sports Information Office. We worked the Bison football games. Before computers, Ken and I announced the official play by play to the media in the press box. I have to admit, I don't think I was the greatest at this job, and sometimes I would get confused figuring a punt from line of scrimmage, where it was received, then the return and the net yardage gain or loss. We had to do this pretty instantly and record it on a big spread sheet, and Ken would announce to the media in the booth what the official play yardage was, who ran it, who tackled who. It's crazy, and it's what happens behind the scenes of bigger, high stakes games televised, but it all comes out pretty smooth when we see it on TV. With that background, I was able to see how diligently Ken works, and I know he put his heart and soul into this book. It shows. Ken tells the story of John Prock growing up in a hard scramble Oklahoma town with less than ideal circumstances in his family. Complete with lots of photos, which heightens the interest of the book, Ken brings readers up through Prock's high school days and details how he made it to Harding as a coach in the 1960s as one of the coaches to re-establish the football program that had been discontinued at some point before. Prock coached three decades and I was struck at how he influenced so many lives. Not to put too fine a point on it, but I look at my life as a preacher and wonder if I have had the kind of influence on 1,000 men like Prock has had. Story after story in the book shows how boys came to be men under Prock's program. A large portion of the book is ten feature profiles of men whose lives have been changed under Prock, both players and coaches. Over and over men say things like, "If it hadn't been for John Prock, I wouldn't be coaching young men today." Imagine, he didn't just influence 1,000 men. If only 100 of those became coaches and have the same kind of influence, he influenced 100,000 young men! Ken also mailed out more than 600 letters to former players, and received back stories from seventy-five of them! Ken placed these stories in full in the book in the order they came back in. The stories are touching, funny, and say the same thing over and over: Prock was one of the best Christian men I ever knew. Stories of coach and his wife caring for sick football players in their dorm by taking them chicken soup when they had the flu, inviting the team over, having "football church" on Wednesdays, humor and sayings, and ways the coach confronted players, apologized when he was wrong. I want to close by saying that Ken Bissell's Many Sons to Glory is a great book to stock up on for Christmas gifts to people like my dad, who loves biographies. I will order more copies now. Here's how to order yours. Go to www.manysonstoglory.com and click the top link labeled, "Buy Now."